We have a new fancy-pants wood-pellet boiler. It is much greener than the old oil boiler, but Arthur is concerned that it is insufficiently insulated and that too much heat escapes out of the top of it. He has therefore taken it upon himself to act as a heat-sink and soak up some of this excess heat, and store it within his person so that it may be available at a later date. 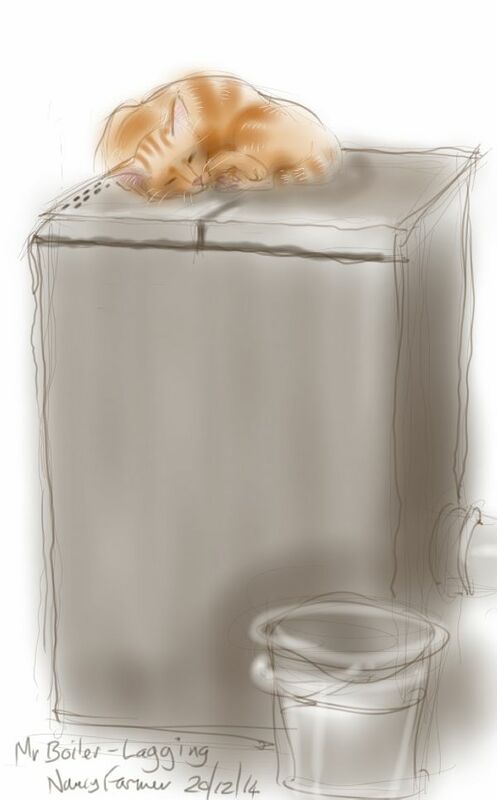 This entry was posted in Cats and tagged art, arthur cat, cat, cat sleeping, cat-of-the-day, digital sketch, drawing, ginger cat, illustration, life drawing on December 20, 2014 by Nancy Farmer. Arthur is like some kind of saint! Indeed, Yvonne, Arthur says he couldn’t have put it better himself!